The outcomes of politics and health care reform at the national and state levels are critical to the practice of pediatrics. Politicians definitely make decisions that directly impact on your work, both in terms of what you do and how much you might get paid for doing it. And the implementation of health care reform will surely impact pediatrics, payments for primary care and how insurers can operate. So we encourage you to vote on November 2nd. In addition, I have outlined some new District initiatives. It is important that you, as a District member, understand the many issues that we work on with and for you. If you have questions or concerns about any part of this report, please feel free to contact me. The District is your statewide organization. We welcome your input. This has been and probably will continue to be a very busy time for New York pediatricians. We have all been following the implementation of federal health care reform and trying hard to understand what it means for our practices. The details are complex and the roll out seems to be slow and in some instances uncertain. But your District and Chapter leadership is trying hard to stay on top of what all this may mean to pediatricians in New York. The intervening variable is the upcoming congressional and Senate elections. Who controls the Senate and who controls Congress will certainly have an impact on how or perhaps, even if, health care reform moves forward. Both of our Senators and many of our congressional representatives are up for election. Your vote matters in health care reform. Learn the positions of your candidates and vote for those who support continued improvements in the quality of and access to children's health. In addition, here in New York, we are ready to elect a new Governor and new state Comptroller. We will also be voting for every member of our State Senate and every member of our state Assembly. We urge you to ask your local candidates where they stand on children's health and on health care reform and vote based on the information you get. How health care reform unfolds in New York State will depend on who is in charge in both the Governor's Office and both houses of the State Legislature. Your vote has the potential to directly impact your practice. Be informed and vote for candidates who support improved access and improved quality in children's health care. Vote for candidates who understand that children are well served when pediatricians are adequately paid for their services. This year your vote really does count. 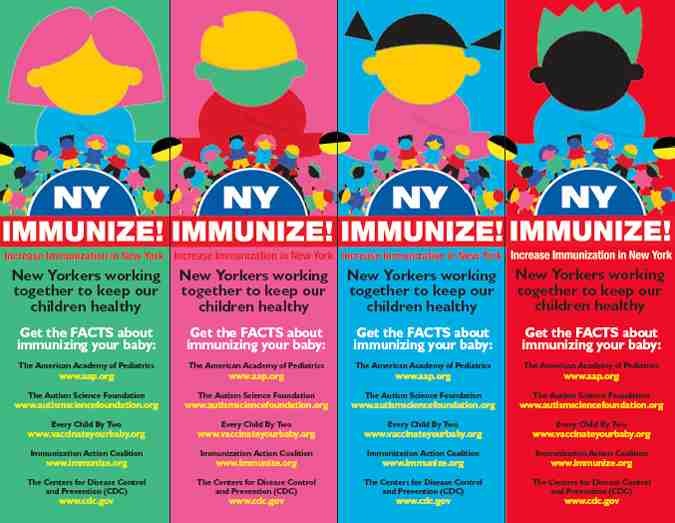 The District held a very successful Immunization Congress on September 14th in New York City. This event was supported by a grant from the National AAP. The Congress brought together two panels of key representatives of vaccine manufacturers, the insurance industry, public health, and pediatrics - office based and academic infectious disease specialists. One panel focused on "The Nuts of Bolts of Immunization in Practice." The other panel targeted "Vaccine Messages...The Family, the Media & the Public." The audience was kept small and reflected the same groups as the panels. The panels were interactive with the audience and engaged in discussion to identify what are the next steps to insure continued high rates of immunization in our patient population. Feedback on the Congress has been very positive. The District is currently formulating next steps. We will keep you informed as we form small groups to take this initiative forward. A report is forthcoming and will be available on the District website. You can access the Congress Agenda here. From May to September, the District's Children's Mental Health Project worked with the State Office of Mental Health, the Academic Medical Centers under the leadership of the University of Buffalo, and the REACH Institute to provide intensive children's mental health training to primary care pediatricians. Training sessions were offered in Buffalo, Rochester, Syracuse, New York City and on Long Island. They were presented by the REACH Institute with the support of children's psychiatric services in each of the University Medical Centers. As the first phase of the training was completed, the District has been exploring with the State Department of Health and with State Insurance Department, how best to structure enhanced payments for pediatricians who will be providing mental health services. We are looking at both an additional member per month add on and key coding options. We will keep you informed as these discussions go forward. We will also be sharing this information with your Pediatric Councils so they can follow up on your behalf with local insurers. The District has also completed a focused Autism Assessment, Diagnosis and Treatment/Referral Training for Capital District pediatricians. The training, developed in partnership with the State Department of Health, Early Intervention Unit, was well received. We will be following up with participants to understand what other supports they may need to strengthen their skills and treatment options for their patients with Autism. To keep the District moving forward, the Executive Committee has decided to develop a Committee on Early Brain Development and Early Learning, to mirror one of the key strategic issues of the National AAP. You will be hearing more about this initiative as we decide the very best way to proceed with our efforts in this new area of focus. If you have a special interest in early brain development and early education and want to be part of this new effort, please let us know. The District has decided to apply for a State Department of Health Grant to improve access to and quality of adolescent primary care. We will keep you informed as to our progress on this effort. Played a key role in developing legislation about concussion and "back to play" rules. This legislation will probably move forward next session. Working on bringing the meningococcal bill back next session. This bill was well supported, but it ran out of time at the end of a very chaotic session. AAP District II continues to be a credible and respected source for the legislature on issues impacting on children's health. Your continued work with us on legislation is critical, if we are to maintain and build our legislative strength on children's health issues.